The other day I decided to use a small paper planner that fits in my purse again, because my Livescribe pen has a developer who makes a paper calendar. WHAT! So I can write in ink that PDFs my paper calendar into Onenote that then syncs to my devices? Sold! FYI it’s really a glorified to-do/project list, not for calendar appointments, that’s all online. Oh, and all its sections correspond to existing Onenote notebooks (I know, don’t say it, I’m a nerd). It’s Martha Stewart-Avery itemed and Franklin Coveyed out and label-makered out and I LOVE it. In doing all this, I thought, maybe we should get a new one for Aidan? He hasn’t used a personal one for at least 3 years beyond his actual monthly calendars that hang around the house. Maybe a calendar to references routines and has goals and also has extra copies of his routines and social stories in it for his dad’s house. Never mind that these are already posted at both our houses and some are photographed in his phone: sometimes there’s the idea of having to flip through something really quickly and something physical to center you. Aidan has an iPhone, iPad, and paper desk calendars, wall calendars, reward calendars and pocket calendars (he collects calendars, always has). We are not tech-shy: he has iphone IEP goals as they relate to self-management and organization: his phone beeps at him at certain times of the school day to alert him to something new and there are video calendars on them for people with autism (as well as other communication apps & tools). His google calendar is shared by me, his dad & stepparents. I can access the notes app on his phone to add items for him, etc. But I know my boy. 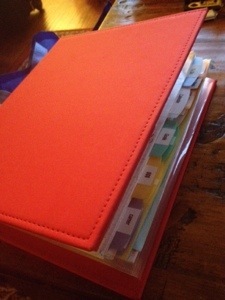 I use my organizer apps just like he does but have a love of paper. How can you not? There’s something about the act of writing–on paper, not with a stylus on a screen–that is AWESOME.